Participants in the PS/QI project groups between July 2018 - June 2019. All groups are considered for selection. All groups will be scored after the end of the academic year (July 2018 - June 2019) based on relevance of project topic, quality of project A3 summary, and potential impact on improving patient safety and quality of care. The selection committee is chaired by Nathan Houchens, MD, Director of the Patient Safety and Quality Improvement Program and Assistant Director of the Internal Medicine Residency Program. The committee also includes faculty project facilitators, faculty representatives from the Department of Internal Medicine Quality Council, and staff from the Department’s Quality Improvement team. 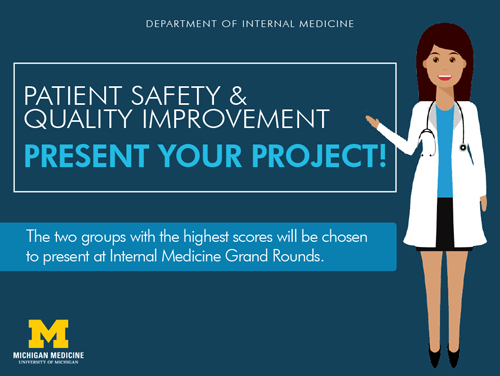 The two groups with the highest scores will be chosen to present at Internal Medicine Grand Rounds on October 11, 2019.